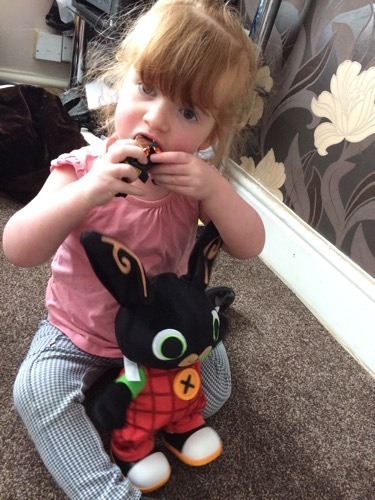 Izebella was one very happy little girl with the arrival of a very special package. Inside the package was a new friend for Izebella, named “My friend Bing”. My friend Bing was sent to us from The Entertainer toy store which is a place we are very familiar with, regular trips there for birthdays and Christmas. 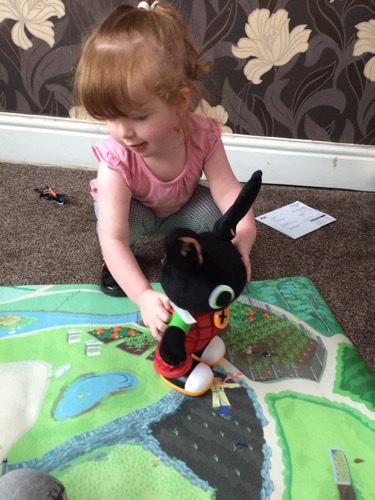 My friend Bing is part of a collection of brand new “Bing” toys from Fisher Price which means quality is assured as with all Fisher Price toys. 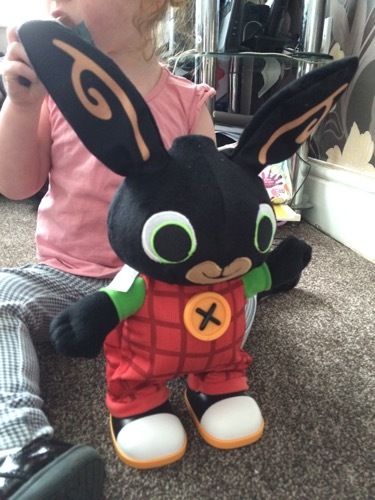 The toys are of course based on the loveable character Bing from the show with the same name on C Beebies. This particular Bing toy comes at £39.99 so is not on the cheap side. It comes with batteries pre installed but what I failed to initially realise is that there is a tiny plastic tab near the battery compartment that needs to be removed to disable the demo mode. I did wonder why it wasn’t doing as much as it should. 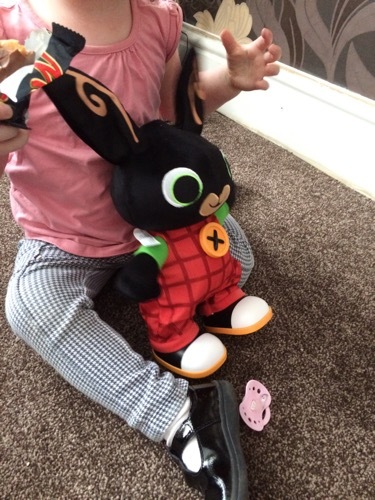 The Bing character resembles a black rabbit with big eyes and dressed in dungarees. The big button on his clothing activates his actions. He will talk, sing, move, dance and play games. He’s a pretty crazy character. Just take a look at our mini video clip. Izebella seemed really fascinated by her new toy friend and does not stop pressing the button to hear him talk or do something. If Bing falls over he who ask for help to get up, so now Izebella pushes him over on purpose. 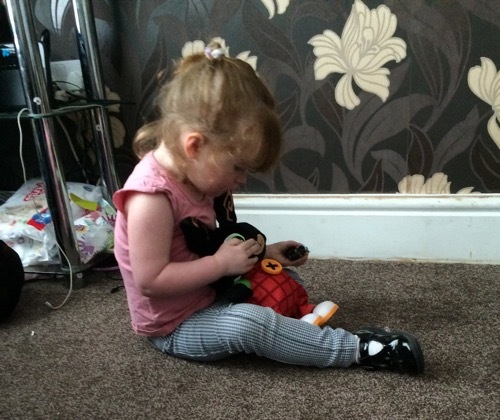 She now tries to take her new friend everywhere and even tries to feed him. We did find that his movement works best on hard flooring such as laminate or tiles rather than soft carpet. 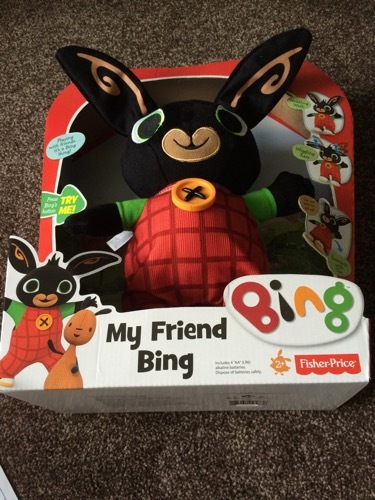 My friend Bing and other Bing toys will be available to purchase from July 1st from The Entertainer. I am sure this will be very popular at Christmas.